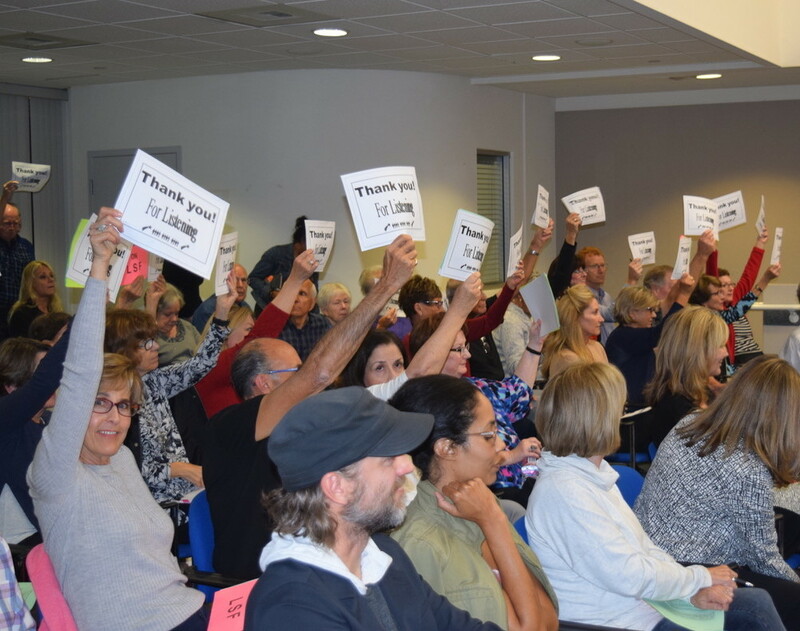 SOLANA BEACH — Many attendees at a Sept. 26 City Council meeting broke into applause when Councilwoman Lesa Heebner submitted a motion to eliminate all roundabouts from the Lomas Santa Fe Corridor Improvement plan. The motion, which passed unanimously, will allow city staff to pursue an alternative striping option that would maintain four lanes along the corridor. The resolution recommended by staff was for the council to consider one roundabout at Lomas Santa Fe Drive and Highland Drive, which is now off the table. At the Aug. 22 City Council meeting, a consulting team of engineers laid out two plans to make the corridor safer and more pedestrian- and bicyclist-friendly — one which would involve restriping the roadway and installing medians, the other which recommended four, single-lane roundabouts along the eastern portion of Lomas Santa Fe Drive. Both plans also outlined a potential pocket park off of Stevens Avenue, a multi-use trail east of Las Banderas Drive, raised medians, curb extensions and buffered bike lanes — features which will continue to be pursued. The roundabout option has prompted an extensive and often contentious response from residents. The city received about 400 comments citywide on the roundabouts, 71 percent of which opposed the roundabouts. On the east side of Solana Beach alone, about 90 percent of residents were in opposition. 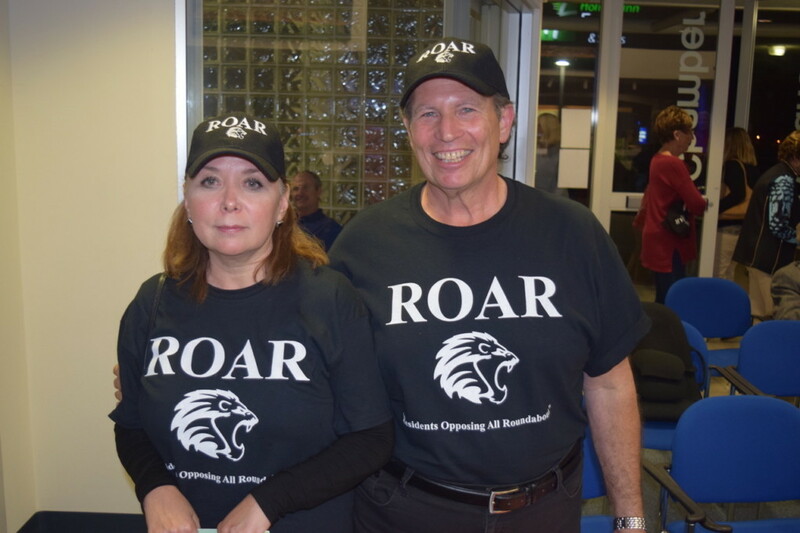 Scott Warren and Liz Molina attended in support of the local group Residents Opposing All Roundabouts (& More), wearing black T-shirts and baseball caps with the logo of a roaring lion. Sitting in the front row at the meeting, they were just two of many holding “No Roundabout” or “4 wide lanes on LSF” signs. Leane Marchese, a seven-year east side resident, said that the residents commenting and attending the latest meetings may not be representative of the community as a whole, and suggested that the city continue studying the possibility of roundabouts. Other residents lauded the bike-ability of roundabouts. “At a roundabout, you’re right out there,” said Dorothy Dean, 84, referring to the scope of visibility provided by a roundabout versus a four-way intersection. Ted Axe, the general manager of the Lomas Santa Fe Country Club, is “adamantly” against any restriction of the Lomas Santa Fe corridor, stating that a roundabout could leave a “potentially huge impact on our business.” The club is located at the intersection of Lomas Santa Fe Drive and Highland Drive. City Council candidates Kelly Harless, Kristi Becker and Craig Nelson all spoke at the meeting, expressing their opposition toward the roundabouts. Now that the council has scrapped all roundabouts from future planning, city staff will move forward with Phase III, which is funded by a San Diego Association of Governments Active Transport Grant for $616,050, with a 10 percent match of $68,450 from the city. As part of Phase III, the city will hold another community workshop in spring of 2019, and preliminary engineering findings will be presented to the City Council in early summer of 2019. The council and Greg Wade assured attendees that the “traffic-calming” goals of the grant could still be satisfied via the striping option. However, Mayor David Zito said he was “disheartened” by talk among anti-roundabout residents of whisper campaigns among council members.